It's that time of the year when folks like to give gifts, and we know it's sometimes difficult to find the perfect item for the mixologist in your life. Regular readers know that when we aren't scrutinizing over menus at local establishments, we like to spend our time trying new and old recipes, testing commercial ingredients, creating homemade ones, and testing various tools and techniques. At the end of the year we usually put together a list of things we recommend. Be sure to check out similar posts from years past to get ideas about tools and other items we have found useful. Here's a great gift idea for anyone that travels, especially during the upcoming holiday season. We call it the Summit Sips Travel Cocktail Kit. It has undergone some improvements after being thoroughly field tested, and although you can make one yourself, we decided to save you the trouble. The Summit Sips Store has these in stock while supplies last. The Summit Sips Travel Cocktail Kit is a compact, TSA-passable cocktail making kit designed to be included in your carry-on baggage for use aboard airplanes. It is the size of an Altoids tin and it allows you to make four (4) Old Fashioned cocktails with ease. Complete instructions are always handy inside the lid of the kit. Every couple of years we run through a list of holiday gift ideas for the mixologist in your life. We have tried more tools and cocktail related products than anyone we know, so we think we have a good grasp of what works and what doesn't. It's safe to say that over the years we have collected some things that we really like—often "trading up" to better tools than we had before—and a we own a bunch of stuff we never touch. 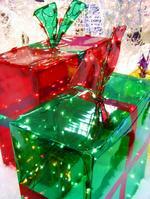 Here is a nice list of our favorite gift ideas. Some of them are special, some work better than anything we have tried, and others represent good values. We have also linked to these items for adding to your shopping cart. One of the best gifts you can give someone interested in cocktails is booze. You don't even have to break the bank (although you might reconsider picking from the bottom shelf) because it doesn't have to be the rarest or the most expensive item in the shop. Pick a decent base spirit and you really can't go wrong. For example, there's no such thing as having too much gin for classic cocktails, and who would turn away a nice bottle of whiskey or rum? Certainly not me, so if you want a no-brainer gift idea that will be used and appreciated, look no further. The problem with this approach is that a bottle of alcohol may not be the most personal or creative gift idea. It will work as a last resort, but you can do better!